Dating can be like a messy jungle. This is especially true early on. Most women go on multiple dates at a time, in an attempt to weed out the wrong dudes. This is where learning how to formulate the perfect breakup text can come in handy as you're narrowing down your search for the one who completes you. Stay vague. While you want to still be honest in your text, being vague is crucial. Why? Because being too honest can hurt the guy's feelings. You can simply say that, while you think he's a great person, you're just not feeling a connection. Sometimes total honesty is justified. If you went on a few dates with a guy who did something to upset you, you can let him know in your breakup text. However, you can still be nice about things. 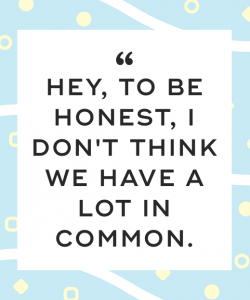 For example, you can say something like, "Hey, to be honest, I don't think we have a lot in common. You brought up some things that I thought were sexist, and it made me feel uncomfortable. But I wish you all the best in your quest for love." Similarly, sometimes a white lie is necessary. If you feel as though you can't be fully honest with a guy about why you're breaking up with him, then it's okay to tell a white lie. When in doubt, you can always use your ex as an excuse. 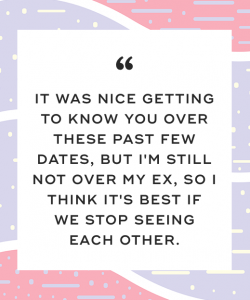 You can say something along the lines of, "It was nice getting to know you over these past few dates, but I'm still not over my ex, so I think it's best if we stop seeing each other." Drop the "p" bomb. No one ever wants to hear the word "platonic" in context of a potential love interest. You can easily break up with someone over text by saying something along the lines of, "It was awesome hanging out with you and getting to learn about your passion for writing. But I wasn't feeling a spark between us, and I think we should keep what we have platonic." Besides ending things early on through text, in what other situations is it okay to break up with a guy via text message? The relationship was unhealthy. If you were dating a guy who made you miserable and was a bad influence on you, then it's totally acceptable to break up with him through text. This is especially true if you'll just end up getting into a fight in-person. He's ignoring you. If your guy is already ignoring you, then you can definitely send a breakup text message. He probably won't even mind. He's abusive. If it's safer for you to break up through text, then you should do it. He cheated on you. If you caught your man in the act with another woman, then he deserves to be broken up with through text. It's a casual relationship. If you're in a more friends-with-benefits type of situation, then breaking up through text is completely justified. He's a liar. If you've caught your dude lying about something major, he deserves being broken up with through a text message. He lives far away. In a long distance relationship? Feel free breaking up through text message without feeling guilty about it! He broke up with you via text. If you got back together with a dude who broke up with you through text, then do the same thing to him when the time comes to end the relationship. He'll see how it feels first hand. Sometimes it's just easier breaking up with a guy through text message. And as long as you weren't in a long-term, serious relationship, you can definitely break up via text without feeling guilty. As long as you're considerate in your message, the other person won't feel hurt. Follow the above advice to create the perfect breakup text, and then hit send! "10 Times It's OK to Dump Someone Over Text Message," Huffington Post, March 12, 2014. "Here's How to Send the Perfect Breakup Text," Cosmopolitan, May 17, 2016. "This is the Only Breakup Text You Should Ever Send," GQ, December 6, 2016.